The 2019 Honda Insight Hybrid is unique in providing the refinement of a premium compact sedan and the fuel efficiency competitive with leading hatchback hybrid models. The new Honda model, available at Mel Rapton Honda in early summer, joins the Clarity series and just-launched 2018 Accord Hybrid as the fifth new Honda electrified vehicle introduced over the past year. The all-new Insight is powered by the third generation of Honda with two-motor series hybrid system, featuring a highly efficient 1.5 L Atkinson cycle gasoline engine, a powerful electric propulsion motor, and lithium-ion battery pack. Total system output is 151 horsepower and 197 lb-ft of torque. Honda's two-motor hybrid technology is unique in that it operates without a conventional automatic transmission. The electric propulsion motor is directly powering the axles and during highway driving a lock-up clutch connects the engine to the drive axles to provide the most efficient operation. The Insight features three selectable driving modes – NORMAL, ECON, and SPORT – allowing drivers to maximizing efficiency or to select a sportier driving mode. Additionally, all Insights have steering wheel-mounted deceleration selectors to choose among three levels of regenerative braking performance, depending on driving conditions. In normal mode, the Insight is capable of all-electric driving for short distances of roughly a mile. The Insight features numerous engineering enhancements to improve ride quality, cabin quietness and efficiency. The Honda body features Advance Compatibility Engineering (ACE) body structure. An aluminum hood, unique to Insight, reduces weight, while additional sound insulation in the engine bay, front fenders, front firewall, and front and rear floor further aids cabin quietness. The Insight utilizes a fully-independent suspension system with struts front and a multi-link rear. Touring models feature liquid-sealed compliance bushings at both ends for enhanced noise and harshness reduction. Precise variable-ratio, dual-pinion electric power steering is fitted for excellent road feel. Braking is by an electro-servo system, which seamlessly combines regenerative braking with traditional mechanical braking for balanced stopping power. 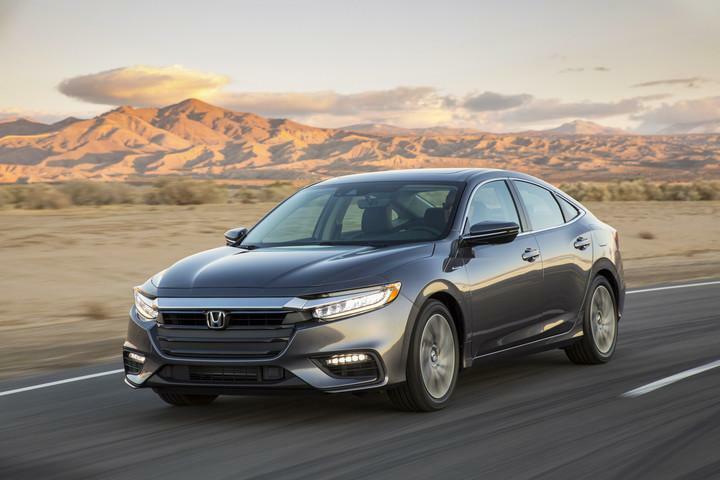 The 2019 Honda Insight boasts a sleek contemporary sedan exterior design with a low, wide stance, sharp, dynamic character lines, and sweeping roofline. 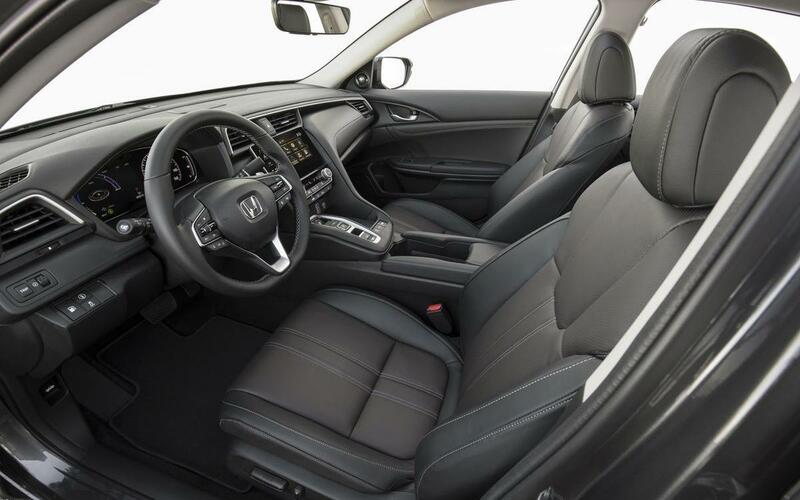 The 2019 Honda Insight interior features best-in-class rear legroom of 37.4 inches, along with a spacious 15.1 cubic feet of trunk space that rivals many midsize cars. The placement of the lithium-ion hybrid battery pack beneath the rear seats provides a fold-down configuration, with a 60/40-split on EX and Touring trims, to maximize cargo carrying and people hauling flexibility. The 2019 Honda Insight will be available in three trims: the well-equipped Insight LX and EX and line-topping Insight Touring. Standard features include full LED headlights, LED daytime running lights and taillights, 16-inch alloy wheels, heated side mirrors, push-button start, a six-speaker audio system, along with Bluetooth and Pandora compatibility. The Insight EX adds two additional audio speakers, SiriusXM radio and an eight- inch Display Audio touchscreen with smartphone-like features and functionality, including customizable app tiles and home-screen shortcuts. The line-topping Insight Touring adds 17-inch alloy wheels, LED fog lights, rain-sensing wipers, a power moonroof, LED side-mirror turn signals, perforated leather seating, heated front seats with eight-way power adjustment for the driver and four-way power for the passenger, dual-zone climate control, embedded Honda Satellite-Linked Navigation System, Honda HD Digital Traffic, 4G LTE Wi-Fi with mobile hotspot capability and Wi-Fi-enabled over-the-air system updates, next-generation HondaLink subscription services, a 10-speaker premium audio system, and HomeLink Remote System. To learn more about the 2019 Honda Insight come into Mel Rapton Honda and speak with our Hybrid and EV experts. They’ll explain all the technology as well as standard and available features in each trim level.